I enjoyed reading the Six of Crows duology, finally a good fantasy duology. But I did not like it as much as Leigh’s earlier work in The Grisha series. 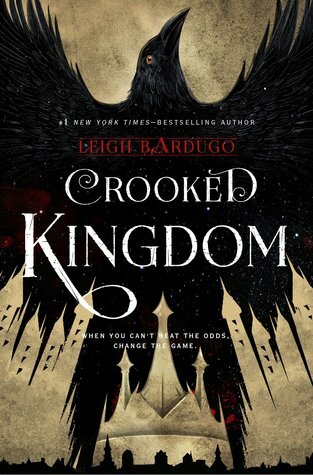 I give Crooked Kingdom by Leigh Bardugo three out of five hearts. I think the novel is an okay story. But I just did not get hooked, which I did get when I was reading The Grisha trilogy. I felt a bit sad about that. The story is fine, no big plotholes and good characters. I just think I like the adventure stories in the Grisha-verse better than heist stories. All the things I liked from the other series were not as present here as I would have liked, which took away from my happiness. One of the bad sides of the plot were that it wasn’t very memerable. It took me one and a half weeks to write this review and I can barely remember what went on, except for what I wrote down. Maybe there was too much in the story or it went to fast, I have no idea. But this is not how I want to remember a novel. It was a bit of a let down. The characters are still well rounded and they all feel real, but they still felt a lot like the characters from the Grisha novels. I started to dislike Nina, her struggle with the withdrawal felt shallow and the whole drug thing rubbed me a bit the wrong way. And that DEATH! I am not gonna say who, but wtf! I love the way Leigh Bardugo writes and her world. I really hope she writes more in the universe, because it is great. But please, write adventures and not heists! She is a super author, but I just did not like the Six of Crows duology all that much. This entry was posted in Book Review and tagged Adventure, Book Review, Fantasy, Leigh Bardugo, Romance. Bookmark the permalink.